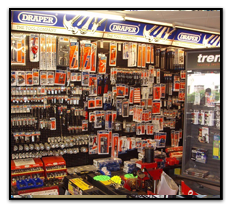 At Toolmaster in Oxford, we make purchasing your tools and equipment easier. Using our suppliers websites you can browse through their catalogues, check stock and take full advantage of the special offers. It’s quick, simple, you can pay online over a secure connection and the goods will be promptly delivered to your door. There are thousands of products to choose from including hand tools, garden tools, ironmongery, decorating materials, power tools, hardware, security products and more. Click on the icons to go to their online shopping websites.